In the middle of the 20th century, the realization slowly began to dawn on earthlings that we were sharing the planet with other sentient beings. Research into great apes revealed a close-to-human intelligence in many cases. Meanwhile, beneath the seas, the grouping of aquatic mammals known as cetaceans (which includes whales and dolphins) was receiving more and more interest from biologists as the possible repository of a profound, human-like intelligence. Long hunted for their flesh and other byproducts (whale oil almost singlehandedly kept the homes of 19th century America lit before the invention of the light bulb), many species of cetaceans suffered from a massive, human-caused die-off by the middle of the 20th century. Immediately following World War II, a large number of countries banned whale hunting, although some nations persist in the practice to this day. In the years after World War II, conservationists, researchers, and advocates for cetaceans began discovering evidence of communication and intelligence among them. With this discovery came the tantalizing possibility of human comprehension and understanding of these creatures’ communications. As with many advances in postwar science, the groundwork for these discoveries was laid during the years of World War II through the Allies’ search for more effective ways to wage war. 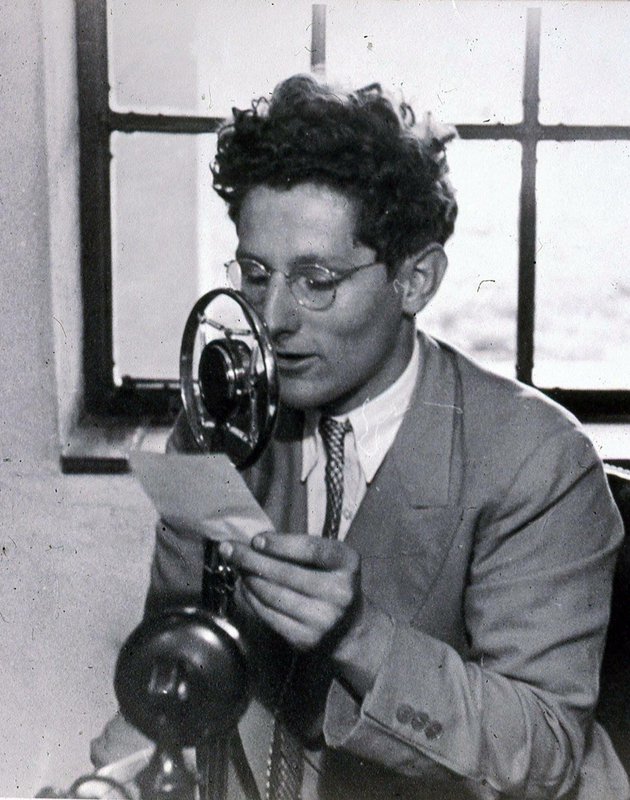 Probably the most famous researcher in this field and advocate for cetacean intelligence emerged from this national defense research milieu: biophysicist, secret society founder, psychotropic explorer, and eventual metaphysical conspiracist John C. Lilly. 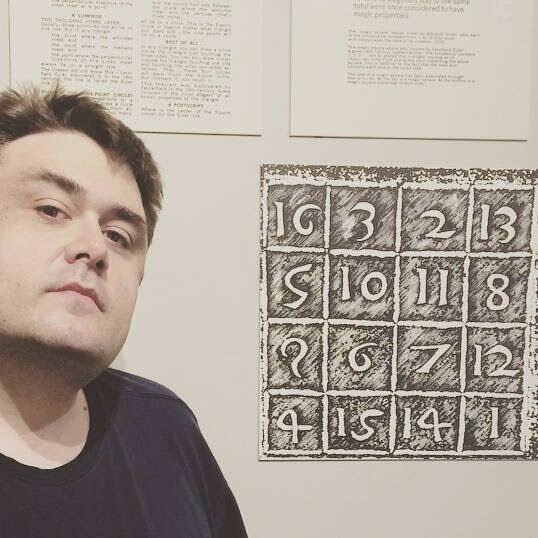 One of the files in the Lilly papers is labeled ‘Indoctrination, Forced,’ and it contains material on solitude, isolation, and ‘brainwashing.’ An adjacent file, labeled ‘Solitude,’ contains, most interestingly, Lilly’s notes on a conversation with ‘Dr. Sperling’ in the Research and Development office of the Surgeon Generals’ office, dated 23 April 1956. The notes read, ‘Called this date, re: brainwashing, etc, mentioned by Dr. Felix before senate appropriations committee (sic) two weeks ago.’ A set of newspaper clippings makes it clear that this exchange took place at the height of Manchurian Candidate fears over the practices of Chinese ‘mind control’ scientists. Lilly himself supplements this series of conclusions in his psychedelic, impressionistic autobiography, 1988’s The Scientist: A Metaphysical Autobiography. Here, Lilly ostensibly tells (in third person!) the tale of his encounter with the military-industrial complex: “At the appointed time and place John walked into the meeting and looked around the long table. He saw approximately thirty people, half of whom were in various uniforms of the United States government.” According to Lilly’s recounting, there was also an executive from Sandia Corporation, a New Mexico-based think tank and research organization affiliated with Western Electric (and eventually Lockheed Martin) that was one of the U.S.’s primary researchers into atomic weapons in the early Cold War period. What were all these defense and corporate doyens so interested in? During this research at NIMH in the 1950s, Lilly worked with primates and other experimental animals, examining their neurological and physical reactions to electrical stimulation of their brains. Electrodes were repeatedly stuck into a primate’s brain tissue, and the physiological reactions recorded, so that a map of the primate brain’s functions could be charted. Lilly split the monkeys’ reactions into “positive” (pleasure, sexual arousal) and “negative” (fear, anger). The monkeys could very rapidly be trained to trigger the positive sensations and shut off the negative, marrying Pavlovian conditioning with electronics and cybernetics for the first time in human history. The possibilities of a defense and intelligence establishment already nigh-obsessed with controlling human behavior and thought were obvious. Lilly’s conscience was eventually strained at the pain he saw he was causing the experimental animals. While he asserts in The Scientist that the tissue of the brain felt no pain from the slim electrodes, when the monkeys’ neurological “negative reactions” were triggered by the electricity, Lilly saw in the faces of these primates reflections of human emotion and feeling. Lilly had already spent much of his early undergraduate education experimenting on himself. But these experiences in the lab in the 1950s firmed up his dedication to regularly making himself an experimental animal as frequently as possible, and opened up his receptivity to the idea of inter-species communication. In the late 1950s, Lilly first began considering the possibilities of cetaceans as experimental models to explore and examine human cognition and intelligence. Part of this interest was the appeal of studying a mammal with a brain size larger than humans, and part was due to the rapidly-growing belief that dolphins and other cetaceans had their own methods of intra-species communication. 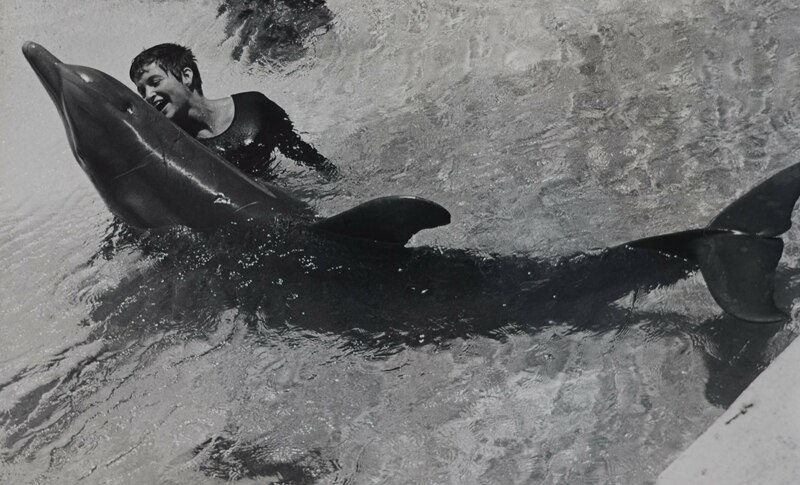 Lilly first met the dolphins in 1955 on a research trip to Marine Studios in Florida. One of America’s first “oceanarium” theme parks, it held captive dolphins and whales that were used for tourist entertainment, movie and newsreel footage, and scientific research. Both the original Creature from the Black Lagoon (1954) and its sequel, Revenge of the Creature (1955), were filmed at the park. The mind fairly reels at the possibility of a young Lilly meeting the dolphins who’d become such a huge part of his life and career while, a little ways off, the “Gill-Man” was abducting a young blonde ingenue and carrying her into the sea. Funding to work with the larger mammals was an issue, as was the question of where Lilly could situate a lab devoted to aquatic creatures who needed a lot of space to live and play. After his encounters with the Defense Department, Lilly was understandably reluctant to involve them too directly in his research. But Lilly happened to be in the midst of a key moment in Cold War history: NASA had been founded with great urgency in 1958 in reaction to the Sputnik launch (and with an expressly non-military mandate; military applications of space technology were grouped under the Advance Research Projects Agency, or ARPA). The Eisenhower administration granted NASA a massive budget to spend in its first few years of existence, and Lilly saw his chance. As we’ve seen elsewhere, NASA funded all kinds of fringe research with dubious scientific value during the 1960s and ’70s. Lilly scouted a location on St. Thomas in the U.S. Virgin Islands for an aquatic research lab and, with federal monies from the National Science Foundation, the Office of Naval Research, and NASA, was able to found his Communication Research Institute (CRI) in 1960. The complex contained an underground pool for the dolphins as well as research tanks and sensory deprivation tanks (more on that in a bit). In St. Thomas, Lilly would spend much of the next decade working with dolphins, researching and publishing his most famous book, and delving into the kind of fringe research outside of cetology that would propel (and haunt) his career for the rest of his life. Within the next decade or two the human species will establish communication with another species: non-human, alien, possibly extraterrestrial, more probably marine; but definitely highly intelligent, perhaps even intellectual. An optimistic prediction, I admit. In this book I have summarized the basic reasons for my beliefs and presented some evidence for the validity of the prediction. In a way this is a crude, elementary handbook for those humans who are interested in the realization of such communication. This is certainly a lot “further out” than his NASA mandate to look into what the cognition and physiology of dolphins could tell us about the physical and psychological limitations involved in human space flight. But the search for extraterrestrial intelligence was also gaining ground in the academy in the early ’60s, and Lilly found his spiritual brethren in this fast-growing field. Astronomers like Carl Sagan and Frank Drake had been considering the implications of communication with alien species, and Lilly had wrangled an invite to the Green Bank Conference in 1961, where Drake spoke about his own “Project Ozma” (named after Princess Ozma of L. Frank Baum’s Oz series) and presented his Drake Equation, meant to help pinpoint the likelihood of extraterrestrial intelligence capable of interstellar communication in the galaxy. The ten attendees of the Green Bank Conference dubbed themselves “the Order of the Dolphin” in honor of Lilly’s work with the cetaceans, and Sagan would go on to visit Lilly in the Virgin Islands to observe his research. At the same time Lilly was diving fully into dolphin research, he was also beginning to examine the possibilities of human research and therapeutic use of LSD-25, as well as the value of using sensory deprivation to unlock human potential. Again, both of these mind-altering tools are well-known to have been part of the arsenal of weapons being researched by the defense-intelligence establishment in the Manchurian Candidate-scare era. In Lilly’s hands, however, they became tools of liberation (or, in the eyes of many, libertinism). As the ’60s went on, Lilly’s research became less physical and more metaphysical, with longer stays by Lilly in the isolation tanks, more use of LSD (including subjecting the dolphins to the drug), and more and more controversial attempts at interspecies communication (including Lilly’s use of lab assistant Margaret Howe as an incidental proxy to induce sexual contact between his experimental dolphins and humanity). This later, more controversial research was detailed in his far more discursive 1967 followup to Man and Dolphin, titled The Mind of the Dolphin: A Nonhuman Intelligence. 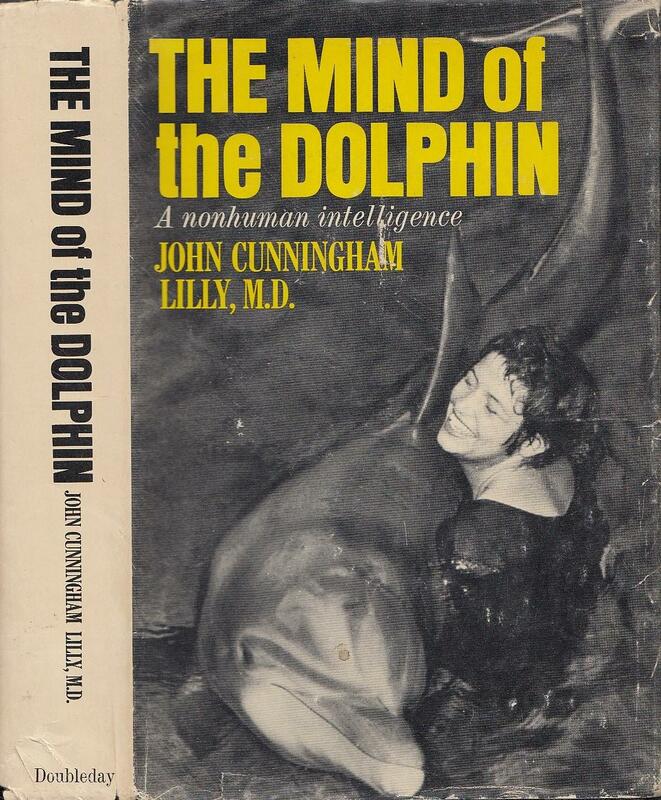 When The Mind of the Dolphin was released, mainstream researchers almost universally began to dismiss Lilly as a crank. The CRI closed shortly thereafter and Lilly gravitated to California, where there was a burgeoning subculture of what would soon be called the human potential movement. Lilly was not the only researcher interested in the mystery of dolphins in the early 1960s. Academics and the U.S. government under the auspices of the Defense Department had seriously begun investigating dolphin anatomy, communication, and echolocation for human applications. The dolphin’s body, honed by 50 million years of evolution to be extremely aquadynamic, was examined for principles that could help submarine torpedoes; the dolphin’s method of echolocation was mined for lessons in same for submarine vehicles. The U.S. Navy’s Marine Mammal Program also trained dolphins for use in military activity—underwater retrieval, mine disposal, navigation, and the like. 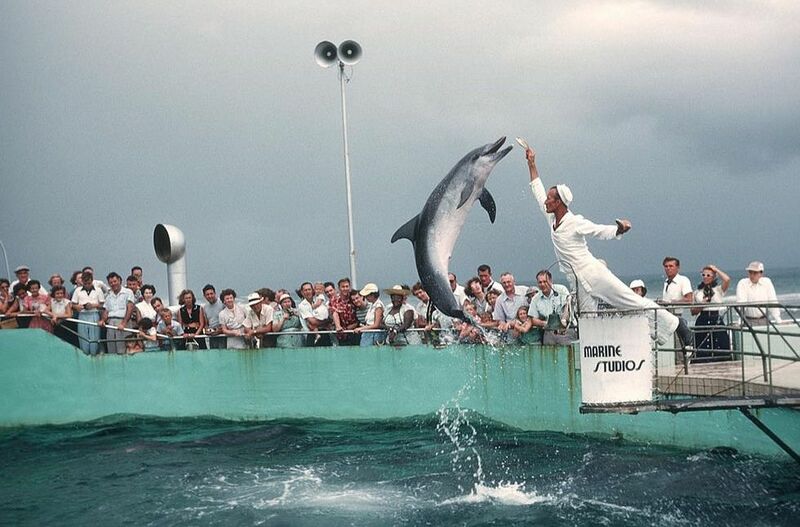 In a bizarre coincidence, one of Lilly’s visits to the program’s headquarters near San Diego brought him into contact with a dolphin trainer named Forrest Wood, who’d worked at Marine Studios during Lilly’s original visits a decade earlier. Wood, who had once worked at a marine amusement park, was now an esteemed Defense employee and Lilly was now the discredited “hippie” without a lab or official research to call his own—a truly remarkable case of the shoe being on the other foot. Right around the time that scientists like Lilly and programs like the Navy’s Marine Mammal Program were exploiting cetaceans, a consciousness was rising, thanks to this research, that the cetacean was a creature worth protecting. French underwater explorer Jacques Cousteau‘s popular books and films throughout the 1950s and ’60s, and the emergence in the 1970s of activist organizations like Greenpeace and Sea Shepherd, would shine a spotlight on the plight of whales and dolphins and their systematic abuse by mankind. 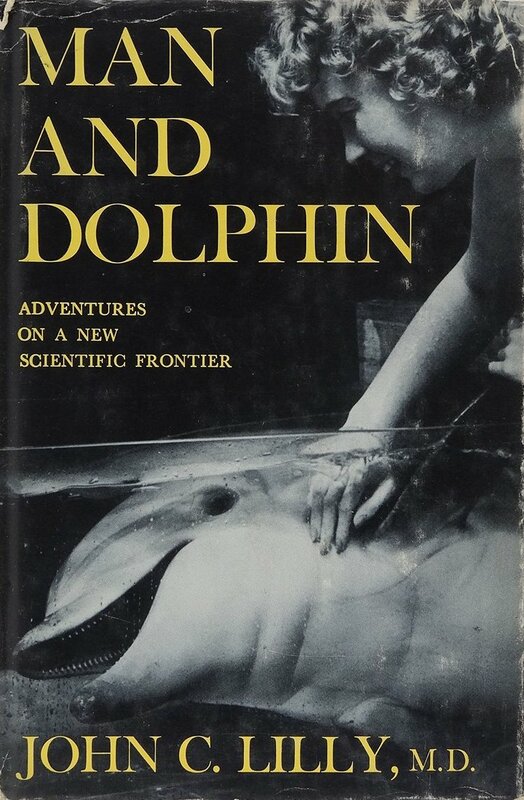 But given Lilly’s sometimes sensationalistic prominence in the non-scientific arena in the 1960s, it’s not surprising that his ideas about dolphins as a form of “intraterrestrial intelligence” found their way into the science fiction (and popular science writing) of the day. In the 1960s and beyond, Lilly’s research would become a thoroughgoing pop culture touchstone. In two weeks, we’ll explore some of Lilly’s fictional descendants, and how his real life ended up becoming something out of the pages of an unbelievable pulp sci-fi tale.